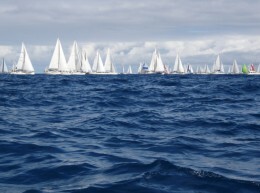 Las Palmas, political capital of the Canary Islands, has been nominated as Europe’s Cultural Capital for the year 2016. European cultural centres which spring to mind include Rome, Athens, Venice, London, Lisbon, Edinburgh, Paris, Avignon, Seville, Toledo, Santiago de Compostela, Cadiz, Granada; Cordoba, of course; Barcelona, too, perhaps. But… Las Palmas? Las Palmas! Nope. The Cultural Capital scheme is an invention of the folks in Brussels. Every year they choose a new city which “highlights the richness and diversity of European cultures and fosters a feeling of European citizenship”. Is this the Cultural Capital of Europe? In a bid to claim this illustrious crown, and garner the wealth which accrues from such recognition, the city of Las Palmas has listed its credentials. These include the auditorium, a couple of theatres, the house where Columbus slept when he passed through the islands, a museum devoted to an artist (Nestor) whom nobody outside the Canaries has heard of, and the Museum of Anthropology. The museum of anthropology is comprised of a wonderful display of pre-Hispanic artefacts, hut models, and mummified human remains, and a visit is highly recommended; but the last vestiges of this stone-age Canarian culture are hardly to be ranked alongside the Parthenon, the Pont du Gard, and Stonehenge. Also on the list of cultural assets is the climate, which is “the best in the world”. Anyone who has ever spent more than a week in Las Palmas will almost certainly dispute this fact – besides challenging the relevance. Can a climate be cultural? 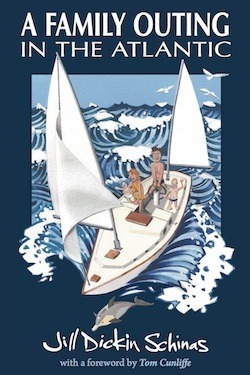 Then, moving on down the list, we find the Real Club Nautico… Yes! As if an organisation which keeps its doors firmly shut in the face of its fellow European yotties could ever be said to “foster” anything but ill-feeling…! But the club is on the list of cultural assets; and so too is the port. 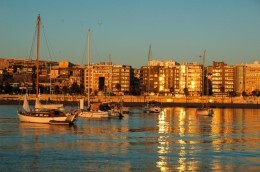 The authorities claim that the port of Las Palmas is a cultural asset. In which case – we say – they should clean it up. This is where our ears should prick up, because if they want the world to believe that their port is a cultural asset – as well as a commercial one – then the people of Las Palmas should persuade their administration to make it a bit more presentable. I’m not talking about paint and strings of fairy lights. That kind of stuff comes way down the list. 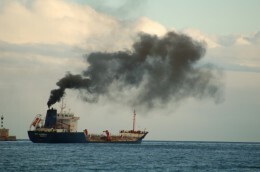 I’m talking about doing something to curb the pollution pouring out of the port of Las Palmas. The beach is also rated as cultural asset. As a matter of fact the city of Las Palmas has two beaches: the splendid crescent which rims the northern side of the town and a small one – squeezed between the two marinas, and adjacent to the anchorage – inside the port. In an a effort to keep this second beach clean the authorities recently limited the shoreward extent of the anchorage….. As if anything that we yotties might produce could compare with the stuff washing across from the commercial docks, opposite! Playa Alcaravaneras – temporarily NOT RECOMMENDED for bathing due to pollution. 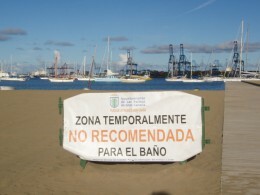 Twice while we have been visiting Las Palmas the beach inside the port has had to be closed due to high levels of oil and sewage pollution. On one occasion there were huge lumps of solid excrement drifting around in the harbour for two weeks. Notices were placed on the beach, but no attempt was made to clean the port of the filth. On numerous other occasions the water has been covered with oil or with diesel. The ARC is surely a modern cultural asset, but it is one which seems to have been overlooked by the authorities in Las Palmas. The ARC is a modern cultural asset, withing the meaning of the act. Since the idea behind the Cultural Capital scheme is to “highlight the richness and diversity of European cultures and foster a feeling of European citizenship” it could be argued that we cruising yotties, out in the anchorage, ought also to feature in the equation. After all, we certainly represent a broad spectrum of European cultures. 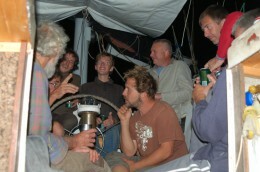 This past year, when the anchorage was full to overflowing, there were representatives from England, Scotland, Wales, Ireland, France, Germany, Italy, Holland, Belgium, Luxembourg, Switzerland, Norway, Denmark, Sweden, Finland, Poland, Russia, Estonia, the Czech Republic, and the People’s Republic of Cornwall (as it said on the back of their boat). Between us we had half the EU covered. Thus it seems to me that we Sea People are in a good position, during the run-up to this Cultural Capital affair, to ask for greater respect, a dinghy dock, and a complete moratorium on the collection of mooring fees. Well, there’s no harm in asking, is there? And if you don’t ask, then you don’t get. Although it posseses no buildings of architectural or cultural interest, cannot claim to be the birth-place of any great culture or of any artistic movement, and is one of the most single-mindedly commercial conurbations on this planet, Las Palmas does actually have quite a bit of modern culture. It takes the form of a series of music festivals. Included on this list are the Annual Jazz festival, the Opera Festival, and the Festival of Theatre and Dance; but if you want to take advantage of any of these you will have to pay. For us – and for a great many Canarios, too – the city’s greatest claim to cultural fame is a free gig, and a big one at that: I’m talking about the week-long World Music (or Womad) festival. Womad (World of Music and Dance) was founded back in 1982 through the inspiration and support of Peter Gabriel. Festivals are now held in various places – including England, Spain, and New Zealand – but to attend any of the other Womad concerts you have to pay. Here, in Las Palmas, the council have decided to scatter the stages around the city and let people experience all that good music for free! I feel bound to point out that although it is the brightest jewel in the city’s cultural crown, Womad actually has no place on the list prepared in the hopes of impressing the EC judges and adjudicators, because it is not a European do. The stars of the 2009 Womad were a gang of Tuaregs – dressed in their blue robes, turbans, and veils – playing rock music on their electric guitars. Runners up included Siyaya, a band of Zimbabwean drummers who danced their way to and fro across the stage. In 2010 we saw another, rather smaller Tuareg band, but their performance was entirely surpassed by that of a Chinese-Mongolian band called Hanggai. Hanggai also dress in their traditional costumes – long embroidered robes and caps – and their lead singer waves a leather horse-whip. Their music is a fusion of rock and traditional folk, and besides using electric guitars and a modern drum kit they also play various weird and wonderful stringed things with funny Chinese names. One of these traditional instruments has just a single string – a thick horse-hair rope – and yet the young man playing it, with a horse-hair bow, can make it cover a full two octaves. Besides making very good use of these traditional instruments Hanggai also employ traditional “throat singing”, a technique which produces an extrordinary sound – sometimes impossibly deep; sometimes ridiculously high – that pretty much defies description. It sounds more like an electrical buzz than any noise ever produced by a man. Hanggai stole our hearts. They didn’t just play their songs, they also communicated with their audience using the international lingo of smiles, claps, and a beer bottle raised in salutation. None of us understood a word that they spoke or sang but still they had us all joining in. This is, indeed, the whole essence of Womad – it is all about participation in music from all around the world. To this end, some of the groups give workshops at which they demonstrate their instruments or teach the crowd how to dance. In 2009 Siyaya had us all jumping to and fro in time with their drums, and in 2010 we learnt a bit of bellydancing. Most of the bands performing at Las Palmas get just one slot on one night of the week, but in 2010 one group bagged two evenings and a workshop as well. They were the Creole Choir of Cuba, and they were worth every second of every minute allowed to them. Despite what their name might suggest, the songs sung by this group are not spirituals and the band has no religious pretentions – but they are all vocalists, making music from their voices alone. 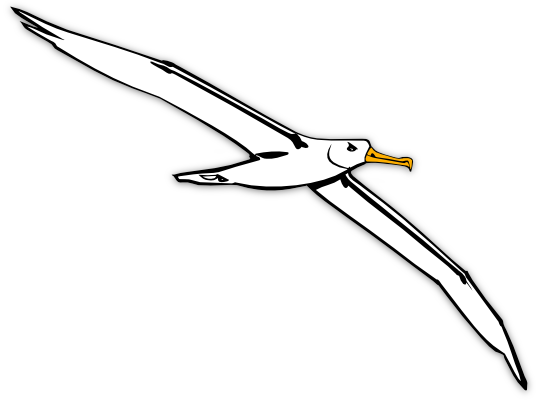 The group’s proper, Cuban name is Desandán. (Their leader couldn’t even pronounce or remember their new stage name, applied by their English managers.) The word means Descendants, for the ancestors of this “choir” were mostly Haitian people – themselves descended from African slaves – who moved to Cuba in the early 1900s to escape from the brutal right-wing dictatorship. The Creole Choir doesn’t have a backing group. Each of the ten men and women, as they sing their hearts out, adds another individual strand to the musical tapestry, and the only other accompaniment that they have or need is a pair of conga drums. None of the band is under thirty, and the lady who writes the musical arrangements and leads much of the singing must be in her sixties; yet she has more power in her voice than most popstars and she dances with just as much energy. If you get the chance to see the Cubans in action, don’t miss out – and if you are in Las Palmas for the next Womad, be sure to go along. The festival takes place in November and coincides with the ARC, but the rally crowd are so wrapped up in their own scene that they don’t even seem to notice that there is an even bigger party going on just 500 yards along the road. While we’re on the subject of music we want to tell you about another Canarian festival. Since it doesn’t take place in the capital city, nor even on the same island, it won’t add an ounce to Las Palmas’ bid for cultural recognition; but it’s tons of fun, and it definitely highlights “the diversity of European cultures”. Indeed, this is multi-European festival which positively screams, diversity. Set in one of the smaller villages, on one of the quieter islands, the Luna Festival is an ethnic, sustainable, bio-degradable, hippyish do, featuring German, English, and Irish nationals most of whom claim some kind of Celtic connection. Ostensibly a week-long music festival, in reality it is a gathering of like-minded freaks, drop-outs, and other happy souls half of whom play their way around the bars and on the little stages set up beside the beach, whilst the others dance – each in their own chosen fashion – beat their djembes and juggle their skittles, or fall down drunk. The locals regard these goings on with a mixture of horror and awe; and that’s why we aren’t going to tell you where or when it all happens. This is a small event which has gate-crashed the village, imposing itself on local hospitality whether or not it is welcome. That it is well-meaning is beyond doubt. It is also fun and funny, lively and lovely, very very special, and very small. It isn’t a secret, but if we shouted about it from the roof-tops it would soon be over-subscribed, over-crowded, and ruined; so if you want to go there you’ll have to pick up the clues and work it out for yourself. 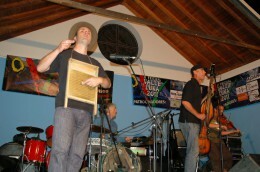 One of the most popular bands at the 2011 Luna Festival was Skazz. This happy ensemble of German, Dutch, and English nationals is proud to hail from County Clare, and their vocalist and trumpeter speaks with an Irish accent; when he isn’t talking in his native German. Pieter is living, loud, and most melodious proof of the fact that you mustn’t grumble about your problems and set-backs; you must just get on with whatever it is that you want to do. And since the camera definitely can lie I must make this clear: Pieter plays dat ting better than most able-bodied trumpeters. Quite how he does it, when he’s no fingers and all thumbs, I couldn’t tell you; but he does. 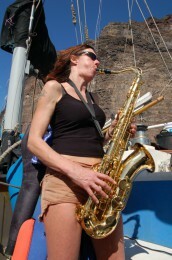 Besides two guitarists, a drummer, and a keyboard player, Skazz also boasts two saxophonists, and the Mollymawks managed to kidnap one of these and bring her out to the boat (“Would you care to join us for lunch aboard the yawt?”). Despite the fact that it was rolly as hell that day, Fiona managed to keep a hold on her lunch and even managed to give us a tune; in fact, she even managed to teach Your Correspondent a tune. Skazz play a mixture of jazz and ska and, although very proud of their Irish citizenship, offered us not one single jig, reel, or ballad. 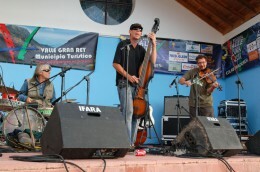 Neither did Coaltraan, who were the only born and bred Irish band at the festival. Their line-up included two guitarists, a drummer, one soulful singer, and a saxophonist whose pleasure it was to walk around the bar. Boy! 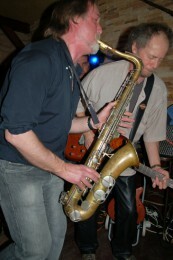 Unless you’ve stood alongside a tenor sax being played fit to bust you can have no idea of how LOUD it is! Mind you, since the bar in question measures only 4 metres by about 15, keeping our distance from the sound was not an option anyway; even if we sat at the bar we were in the lead singer’s lap. As I said before, this is a very small festival; small and very very intimate. 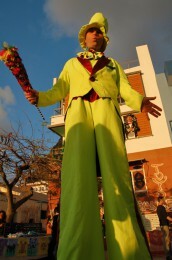 Besides the various bands, performing on stage and in the bars, the 2011 Luna festival also boasted fire-dancers performing in an impromptu fashion on the beach; a craft market – organised by local Canarios and ex-pat Germans; a stilt walker in a fluorescent yellow suit; and a street band which, so far as one could gather, welcomed all-comers… provided they spoke German and knew enough German folk songs. The undoubted stars of the whole show were a local band whose members included the stilt walker (minus suit and stilts) and one of the Gomeran Street Band. Going by the name of Poisoned Folk, this Canaries-based group consists of a German drummer, a German fiddle player and singer, and Tony Reece: a tall lanky Eastender with enormous paws and a nose to match. Tony plays contra-bass and accoustic guitar, and he writes and sings his own ridiculous songs – songs with names like, “Please Don’t Jump”; “Formica”; and “I’m a Wanker”. As he sings the words Tony’s huge hands hop up and down on the stem of his long, thin, electric double bass; his booted toe taps the ground, and as his mouth chews the words, shaping them and popping them out, his eyes bulge with a kind of manic glee. Nor is Tony the only cartoon character in the line up. Behind him, crouched amongst his drums, sits a percussionist who might have been modelled on one of the Muppets; either that or he’s a caricature version of an aged Rolled Stone. 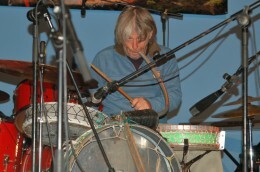 His drums, held together with bailer twine, are perfectly in keeping with the image. The bass drum has a rock sitting inside it to keep it from falling over, and the cymbal is held in place by a screwdriver. Every now and then “Rowf” gets wildly excited, the screwdriver flies off – followed by the brass flying-saucer – and the fellow has to stop his drumming and bend over and look for it. These amusing details make little or no difference to the music, but the drum kit possesses one other eccentricity: it is inflatable. Well, that’s a bit of an exaggeration – but one of the drums is semi-infatable, and from time to time the mad drummer grabs hold of a PVC pipe, tucks it into his mouth, and puffs his grizzled cheeks. By this means the drum can be worked in the same fashion as an African talking drum, whose tone is altered according to the changing pressure on the strings and the consequent variation in the tightness of the skin. One might imagine that two crazy characters would be enough for one small band – but, no; the third member of the line-up is another comedian. Ace violinist and low whistle-player, Tom Gluck looks as if he might be a doctor or something of that sort in real life, but get him on the stage and he takes on the appearance and manner of a cheerful lunatic. Perhaps it’s a trick that he picked up in Ireland, where – they say – he learned to fiddle. Certainly, this man’s passion is for Irish melodies, and the band plays turn and turn about, with jigs and reels evenly interspersed amongst Tony’s wonderful songs. It’s a mixture that works very well, just as Skazz‘s hotch-potch of Louis Armstrong and Madness goes down a treat – as I said at the outset, this festival is a prime example of diversity – but the real killer is Tom’s voice. A German mimicking an Irish accent…? You just have to hear it! 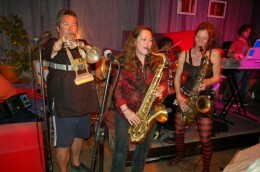 Rob-the-Bones – pictured here playing on Mollymawk’s washboard…! The nearest thing that Poisoned Folk possess to the comic’s straight man is Rob the Bones; and Rob is only a part-time member of the band, roped in for the festival; and he’s almost as funny as the other three. Rob is a stilt-walker, juggler, cross-channel cyclist, Irish citizen, English ex-pat, and the World’s Greatest Bones Player. He also has the most active pair of eyebrows we have ever encountered, and all the while that the other chaps sang and scraped and plucked and bashed, Rob rattled his bones and his eyebrows danced up and down. When I say “his bones”, they’re actually a camel’s bones; and he found them on the top of a volcano in the Sudan while he was working for the VSO. An interesting man, with an interesting tale to tell – just like everybody else performing at the Luna festival. While Poisoned Folk play, delighting us with their wit and their unique music, the crowd put on their own performance. A hippy clad in a long white dress swirls to and fro from one side of the stage to the other in what she presumably takes to be an elegant improvisation. And dodging under the lady’s upraised arms is another woman, dressed in tight trousers and a cotton skirt. Although the weather is anything but cold – and the Mollymawks are wearing our habitual flip-flops and shorts – the girl’s feet are encased in pixie boots and on her head she carries a huge wooly hat with a tassel that almost sweeps the ground. Behind these two, on the edge of the crowd, a man is prancing to and fro with the dainty movements of a hippopotamus. His arms are held aloft, and on his face is an expression of perfect rapture – or total intoxification. Standing on the edge of the adjacent throng is an Irishman – pretty much the only true Celt in this pseudo-Irish gathering – and to prove his point this man is wearing a green beret and an orange skirt. One or two of the gathering seem to be Spanish, but they probably come from the mainland and the only Canary-Islander that I can find amongst them is a drunk. Having been sent packing by Yours Truly, after he tried to grab my camera, he is now hopping about with the others in front of the stage, alternately grinning in delight at the two ladies as they take his hands – kind-hearted hippes that they are – and shaking his fist in the face of a man who is trying to photograph the band. I guess he doesn’t like photographers. And where are the other villagers? Are they tucked up in front of their tellies, pretending that the whole thing is not happening to them? No; they are lined up beside the stage – sporting their most square (non-hippyish) clothes – and the object of their interest is not the band itself but the audience. The expressions on their faces range from mild disapproval to incredulity. Are they experiencing a “feeling of European citizenship”? Possibly they would like for the Canary Islands to break away from Spain and from Europe and rediscover its own cultural identity. Meanwhile the rest of the crowd – originating from various European lands – have forgotten all about their diverse “citizenship”, because when a crowd of likeminded people get together their nationality is totally irrelevant. What we have here is a feeling of unity and contentedness which goes beyond the Euro Club feeling that the EC people seek to inspire. Let’s just hope that they don’t find out, because the last thing this little place needs is to be placed on the map.